Sometimes when trying to get a concept or idea over to children it is a good idea to start from a story or illustration to get their interest. Below is a recent article discussing the Hobbit and its various translations and also the different illustrations depending on where it was published. That in itself is quite remarkable but also is the fact that JR Tolkien was happy to allow different illustrations from my experience of the publishing industry once they have their mind-set on a particular picture or illustration nothing changes their mind. That is why I am offering individuals the chance to create their own book using a template allowing them to have exactly what they want and not what someone else perceives they want. It doesn’t have to be bilingual or anything specifically to do with languages just one language is fine. Please get in touch if you wish to write in a language other than English so that we can discuss the correct font. 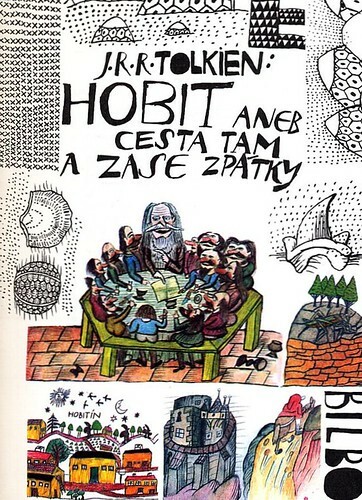 The Hobbit has been translated into many different languages, and these translations have often been accompanied by fresh and interesting illustrations. Naturally a Latin edition (popular in Latin America? ), Hobbitus ille aut illuc atque rursus retrorsum, published in 2012. There are two Persian translations, one published in 2002, and another, هابيت يا آنجا و بازگشت دوباره (hābit yā ānjā va bāzgašt dobāre), published in 2004. It’s wonderful that hobbit is almost the same word in Persian: hābit, and it may well be that Persian children are reading hābit yā ānjā va bāzgašt dobāre right now. There are at least five Russian translations, some of them are supported by splendid illustrations by the Soviet artist Mikhail Belomlinsky, done in 1976. He also did new maps with place names in Russian. You can check out the 1976 Russian Hobbit here (Note that Bilbo is shown having hairy legs and not just the top of his feet — this was due to a mistake in translation.) Our country is fortunate to have Mr. Belomlinsky, who has done many other fine illustrations, living in New York since 1989. Cover for Czech edition, by Jiri Salamoun. And here is a webpage which collects some of the cover pages and a few illustrations from the many translations. Some of my favorites were done in 1973 by Jiri Salamoun for the Czech edition. His work is more primative, and is disrespective of tradition proportions, but seems to fit better the mood of adventure and fantasy conveyed by the book. Strategies to support students with language learning needs. Arrivals with various levels of English. These will need to be able to catch up with their peers and once there will have the ability to communicate in both languages particularly if the first language is used as a bridge to the second particularly in relation to academic language. Students for whom English is their first language but have difficulty in language acquisition. Use a language mentor someone who has a good model of language themselves. If EAL learners they can also be encouraged if of a similar language to keep their 1st language alive. When planning think about the words that the learner will need to engage in the lessons, actively pre-teach these words. Remember that each word needs to be taught and applied more than once usually around 5 times before it becomes known. Increase usage of these words until they become embedded. Never teach a word by itself, if taught in context and with visual or aural aids these will help remembrance and contextual use. Use prior knowledge and learning when introducing new ideas. One way to do this is via mind mapping or by video capturing a conversation where the children answer questions that draw out their knowledge. (NB the teacher needs to give the questions as a starting point). Specifically for EAL children you can use Two can Talk where the mentor or buddy can ask questions in English, have it translated into their peers language. The peer then answers via the keyboard in their first language and it speaks aloud in English. This can be captured via the PDF icon so that as a teacher you have a record of their discussion. Learn how to say the learners name properly. If you cannot understand them then ask them to repeat it, if necessarily ask in a different way. Make sentences short and clear. Sentences with too many parts of it will confuse, some students will not know which part to complete. Allow the student time to answer and don’t show impatience of yourself. Repeat/ Recast the answer so that the children can hear the correct pronunciation or sentence structure. Use a variety of activities to engage the learner including visual and hands on activities to support the oral instruction. Use scaffolding to develop their language further. Change plenaries to a variety of feedback sessions not just Question and Answer sessions and recast where necessary. I thought I had posted this last week but the letter gremlins seem to have taken it away into space. “It’s important for me, because my children are from here. I’m from Mexico, and I want them to know their origins,” said Ana Lepe, speaking in Spanish. The 40-year-old mother of three has sent all of her children to Geddes because she also believes being bilingual will help them get better jobs in the future. I liked this story because this school is obviously one where bilingualism is really treasured and supported by all within the community. Once again the question of jobs when the children reach school-leaving age are a focus, but sadly this is often forgotten by the policy makers. What is useful for teachers is If you go through the links there is also a video showing how some of this is achieved. “There’s a lot of research now that shows that dual-immersion programs/bilingual programs are teaching kids to read better,” she added. One reason the dual-language program works at Geddes is because it’s one part of a strong academic structure, school officials say. Castro is obsessed with data: Teachers give assessments every two weeks in math and reading to see how their students are progressing and where they might need help. As bi-literacy starts to become popular and general literacy is a focus in both USA and UK schools there are some lessons that can be definitely learnt from this school. Especially those wishing to become strong free bilingual schools. The initial news story is interesting but if you go into the school website there are some amazing facts about their achievements. 10 % OF PUBLIC SCHOOL STUDENTS ARE ENGLISH LANGUAGE LEARNERS. The Challenge: For English Language Learners, mastering the language is even more difficult if they struggle with their first language. The Solution: At Geddes Elementary School in Baldwin Park, Calif., young students in the dual-language program are taught in Spanish 90% of the day until third grade. This approach has led to significant achievement gains, with 60% of third-graders scoring proficient or above in English language arts in 2011. Geddes Elementary School’s API score (California’s system for rating schools based on reading and math test scores) rose from 678 to 838 over four years, exceeding the state target of 800. Proficiency on English language arts tests doubled to 62 percent, and the percentage of the school’s students who are proficient in math rose by half, to 74 percent. In the 2005-06 school year, 391 students (out of 901) had unexcused absences or were tardy at least three times at Geddes. The truancy rate was 43 percent. In 2010-11, by contrast, 192 students (out of 703) had unexcused absences or were frequently tardy. The truancy rate fell to 27 percent. Parental participation went from only a handful of parents regularly visiting the school to between 40 and 50 attending monthly meetings with the principal. Literacy is one focus of OFSTED in the UK from the start of this month. First let us be clear what Literacy means…often these words are used without much thought about what it means… Literacy in education is how we help children enjoy reading and writing, with focus on three areas speaking and listening, and reading and writing. With EAL learners John Foxwell Director EMASUK suggests we look at how to use Pip to support the parents reading to the children in either language (bi-literacy will also be improved when used effectively), use this lovely book to allow them to read to their siblings and new arrivals in English. Pip itself is bilingual so can be used to develop vocabulary by using the first language as a bridge. There is also the advantage of the picture book being part of the range, so that the parent/teacher and child can see how they have progressed in their development of their reading skills. He further suggests starting points for conversations, and when linked to the computer programme it scaffolds writing by giving word lists. It encourages story boarding by linking up pictures and words and develops personal awareness by making children think and discuss how they feel. And so to OFSTED themselves. OFSTED Inspectors report that they have found that the factors that most commonly limited pupils’ learning included: an excessive pace of a lesson; an overloading of activities; inflexible planning, and limited time for pupils to work independently. In some schools teachers concentrated too much or too early on a narrow range of test or examination skills and few schools give enough thought to ways of encouraging the love of reading in school and beyond the classroom. OFSTED have themselves suggested the following as good examples of how to develop good reading practice to support literacy development. To get the reading habit integrated straightaway, in the first term of Year 7, the English homework for all students is to read independently at home. The school launched a joint parent/child reading group, attended by a local author, which inspired parents and pupils. Family Review Days held in the library give parents the opportunity to talk about books with the librarian and with students. They can drop in anytime to discuss how they can help their child choose a suitable book and offer support and encouragement. The school annually updates and sends out a list of recommended reads to reflect current trends in reading as well as classics. It also produces ‘Reading Matters’ leaflets for parents, with useful hints and tips to support their child’s reading, which include the following. • ‘Read aloud with your child, or try reading the same book they are reading and talk to them about it. • Let them see you reading, whether it is a book, a magazine or a newspaper. Lead by example! • If they enjoy movies or TV shows based on children’s books such as Tracy Beaker or Harry Potter, encourage them to give the books a try. • Encourage them to read to younger brothers and sisters. We have a ‘babysitting’ box in the library with great books they could use. John Foxwell reminds us that Pip is available as a picture book or English only, or bilingually in English and Polish, Albanian, Chinese Mandarin, Chinese Cantonese, Czech, Dutch, Russian, French, German, Nepali, Kurdish, Hungarian, Norwegian, Hebrew, Latvian, and Romanian http://shop.emasuk.com/ Add storycreator to make a truly useful inexpensive package for all language learners whether learning English, MFL Languages or bridging from their home language. Following on from the last blog about reading. I thought about the types of questions I would ask my EAL readers, or indeed other readers, about the books they have read. Most questions need to be open questions otherwise the reader doesnt have the opportunity to tell you what they gained from the book. There is nothing worse than 30 replies of my book was …… written by ….. I liked it …..because and then the reason doesnt really show you what they have enjoyed, liked etc. This set of questions is just here to help you stretch them and give you some ideas. If you have further suggestions please add to the comments. After starting off with finding out the name of the book and author, find out what the book was generally about and if they have been taught about genres what genre/style is it e.g. mystery. If they have been on an end of term break you could ask where they read the book, in bed, outside on the grass, on the beach etc. How different was it to how you thought it would be before you read it? … some choose books from pictures on the front and then find the story doesn’t match at all. Was the cover a good cover to let you know what the story was about? For more advanced readers was the book as good as the back cover details led you to believe? Did you want to read it right to the end ….if not what made them feel this way but what kept them going if they did… I was given the Water Babies by Charles Kingsley as a child after an operation in hospital. I couldn’t read it then and havent been too since as it all seems to far-fetched, although I have tried many times I get as far as the chimney sweeps and that’s it . What was your favourite part of the book? This may be a line, a character, a part of the story try to draw out as much information as possible. What caught your attention? …we often tell them that the first line must when writing, but it is not necessarily the same when reading ? It may have been something much further through the book. Which bits didn’t you like? ….this gives you further ideas of the types of books they may enjoy and ones to start to drop. Did you read the bits you didn’t like? …… If it is gory I don’t. What was different about this book … if it’s a series has one of the characters shown a different side to their character, is the adventure in a different land which is different to either this country or the previous country they lived in? Would you read books from this author again? Why/Why not ….I did love Enid Blyton and the adventures of the characters, probably why I like Agatha Christie’s Poirot in adult life. What made you think about the book now you have finished it … they may have liked it so much they want to read more or it was so awful they don’t want to read similar stories again. My daughter was sent home from school with the book ‘There a monster under my bed’. We duly helped her read it but at 20 we all still remember the nightmares it gave her because it made her think there may be something under the bed? Reset the story in another setting e.g. if they come from or speak Chinese set in China what differences would that make to the story? If they were the author show the changes they would make to make it better… this could be as simple as a new title or more in-depth by adding a new character. Take a children’s author e.g. Enid Blyton and compare with a similar Adult author e.g. Agatha Christie and look at the similarities in the plot , characters, locations etc. Find out the authors history and work out what aspects of this are within their work e.g. location, if they worked in a tax office maybe the story is set within this industry etc.